I was given a baby plant by my uncle; he told me he thought it was an Aloe vera. Since then I have 2 adult plants and many saplings which originated from the one plant. Its leaves seem to stay flat to the soil. It stands around 10cm high. When the leaves are broken it does look like an Aloe vera inside but the leaves seem quite thin compared to other Aloe veras I have seen and the edges don't seem to be as serrated. Thank you in advance for any help or advice. Hi Emma, well your uncle is partly right - it's an Aloe, but not Aloe vera. 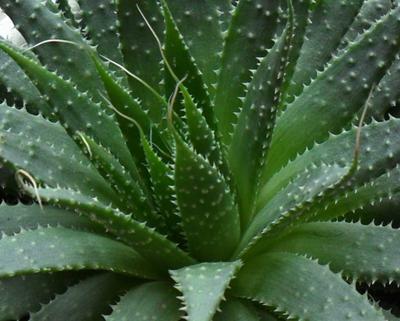 The genus all have the same feature of mucilaginous sap in the foliage, which can be used for a skin salve in the case of Aloe vera. 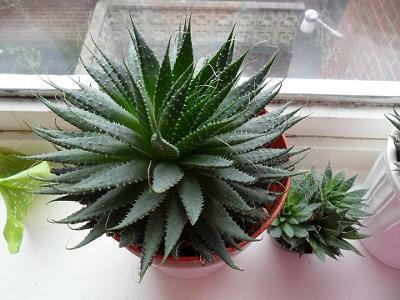 This one is most likely Aloe aristata, and as you've found is easy to propagate. Care for all Aloes is the same; warm, bright conditions, and in the summer if they can be outdoors (not where they'll get too much rain though). Good drainage is essential - both in the soil you use for them, and the pot that you keep them in.